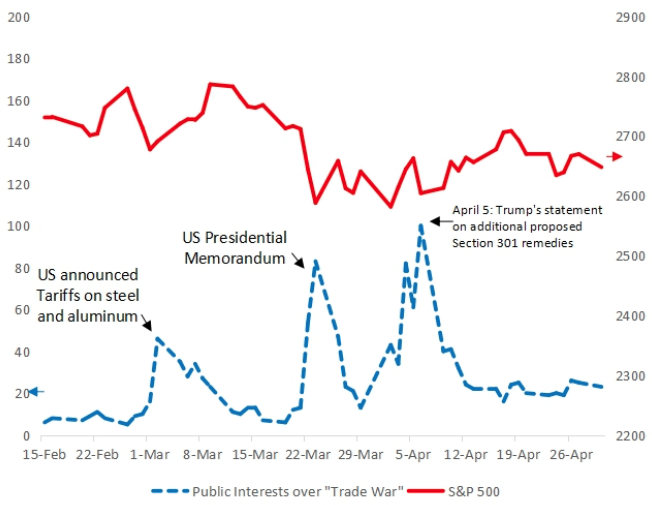 How the market responded to the Trump administration’s announcements of tariffs on imports from China. So what are the costs of the trade war? Most of the recent discussions mainly focus on the trade flows and trade policy (Crowley et al. 2017, Bown 2017, 2018, Frankel 2018). In a recent paper (Huang et al. 2018), we study instead firms’ financial market responses to the various announcements in 2018 by both the US and Chinese governments of their intentions raise tariffs over a comprehensive lists of goods imported from each other. Our findings show that whether a firm will win or lose during the US-China trade war depends on the extent of its participation in the global value chains shared by the two countries. While raising the prices of imported goods can transfer profits from foreign to domestic businesses, our study shows that this benefit is far outweighed by the (perceived) increases in input costs. Given the complex structure of US-China trade, most firms in both countries would not be isolated from such negative cost shocks.